Review published in IJPE, Vol. 8, No.3, May 2012, p.299. tool that the authors have made use of handling such systems is multi-dimensional D-spectrum and marginal D-spectrum. D-spectrum is basically a multi-dimensional discrete probability distribution. The D-spectrum is combinatorial in nature and depends solely on the system structure. Since combinatorial reliability computation often results in a large number of states and is computationally unwieldy if not impossible. Here, the authors suggest the use of Monte Carlo simulation. D-spectrum approach allows an efficient Monte Carlo procedure by approximating system D-spectrum to compute system reliability and its resilience. Usually it is not easy to compute network component importance, more specifically the Birnbaum's Importance factor which involves computation of a gradient. However a modification of the D-spectrum called BIM-spectrum makes its computation as well as the computation of the Joint Reliability Index an easy task. The authors further propose a simple analytic method of calculating the D-spectrum for series-parallel and hierarchical systems, knowing the D-spectra of their subsystems. As is evident from the table of contents, the book has only two chapters. 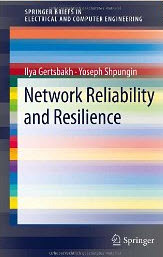 While the first chapter deals extensively with the theory involved in the proposed approach, the authors have taken pains to illustrate the methodology through several examples, which include pre-disaster management of a road network and a resilience comparison of regular and scale-free networks subject to random attack on the nodes. Actually, the book uses the probabilistic description of a network in the process of its successive degradation due to removal of its components (links, nodes) as a result of failures, natural disasters or intentional attacks. It is focused on a practical approach to network reliability, based on application of Monte Carlo methodology to numerical evaluation of network most important structural parameters. This allows obtaining a probabilistic description of the network in the process of its degradation, to identify most important components and to develop efficient heuristic algorithms for network optimal design. The approach can be used satisfactorily for small–to-medium size networks. Review published in the International Journal of Performability Engineering, Vol. 8, No. 3, May 2012, p.299.